Do you have a bicycle that you no longer use? 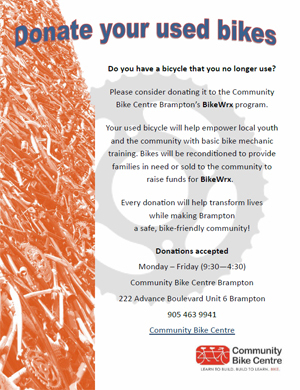 Please consider donating it to the Community Bike Centre Brampton’s BikeWrx program. Your used bicycle will help empower local youth and the community with basic bike mechanic training. Bikes will be reconditioned to provide families in need or sold to the community to raise funds for BikeWrx. Every donation will help transform lives while making Brampton a safe, bike-friendly community!